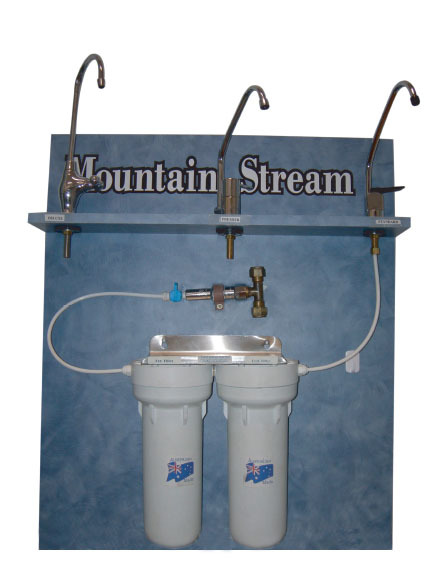 Neat and compact, the Mountain Stream Twin Under sink water filtration system can be conveniently installed under the sink and comes with your choice of attractive, designer chrome taps. The taps can be easily mounted on your stainless steel sink, or corona or granite bench-top. Mechanically filters out dirt and sediment. Removing the above contaminants protects the chemical removal cartridge allowing it to function more effectively and last longer. The second stage is where the chemical removal filter functions. With this system you have endless filter options from disposable carbon cartridges to re-cleanable ceramic cartridges. In most if not all cases the filter in the second stage removes all chlorine, chemicals, pesticides, unpleasant tastes and odour along with harmful heavy metals. Please contact our sales team to discuss filter options 03 9374 1100. The Mountain Stream Twin Under sink is self-maintainable. If the flow rate slows, you may need to replace the filter in the first stage to extend the life of the chemical removal filter. Cleaning frequency will vary depending upon water quality and use. 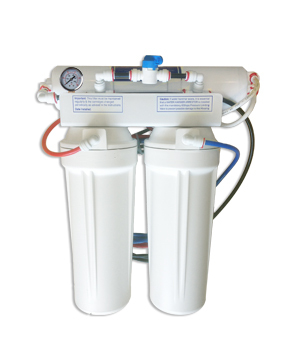 Adopted from the Twin Under sink comes this simple 3-Stage Reverse Osmosis (RO) system, which easily connects to your mains plumbing. The additional Reverse Osmosis membrane integrated to this system focuses on removing parasites, bacteria, viruses, chemicals and heavy metals. Removing particulate matter from the water supply, including rust, dirt, sediment, sand & algae. High performance of 300 Litres per day, this filter removes bacteria, viruses, parasites, chemicals and heavy metals at an efficiency of up to 0.0005 microns. Removes any bad taste or odour providing superb tasting water. For the discerning customer looking for a thorough yet practical means of water filtration. This system effectively removes salts, micro-organisms and high molecular weight organic impurities, heavy metals, chemicals and pesticides. Note: the system’s effectiveness depends on the water temperature, total dissolved solids in feed water, operating pressure and the overall recovery of the system. State of the art technology in water purification, the ultra-high purity Reverse Osmosis system offers a compact design, with easy maintenance and hygienic twist-off filtration cartridges. Of all the methods to purify drinking water for domestic use, the process of reverse osmosis is the most advanced, economical and effective. High performance 140 litres per day. Pore size – 0.0005 microns. 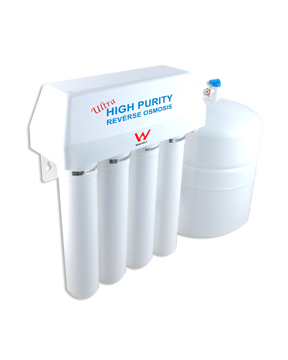 The Ultra high purity reverse osmosis system is the number 1 choice for the discerning consumer who wants the very best product available. Ideal for allergy suffers and those that desire fluoride free water. When the pre sediment and pre carbon filters are blocking. If the automatic shut off valve is functioning properly. If the mains incoming water pressure is adequate for optimal operation of your RO system. Leak detection safety device. Automatically shuts off the water supply to the system in the unlikely event of an occasional drip from any of the fittings or your existing under sink plumbing and waste drain. Alerts the customer to 12 months of usage. The NSF certified storage tank is encapsulated in high strength polypropylene to prevent any rust to the outer surface. 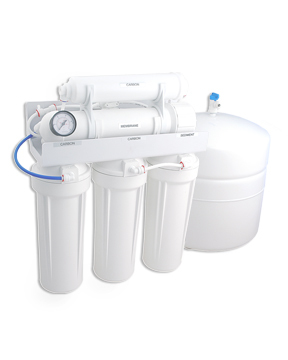 The RO-5000 is the conventional reverse osmosis under sink system. This unit offers a five-stage filtration process recommended water filtration experts around Australia for the past 15 years. It may be adapted for high production fish tanks, aquariums, autoclaves and many other commercial applications. Dust, rust, sludge – particle removal. Chlorine removal – membrane protection. Micro particles removed – 0.0005 microns. Fine grain de-dusted acid washed coconut carbon. Final polish – resulting in superb tasting water. System capacity depends on the water temperature, total dissolved solids in feed water, and operating pressure. Optional Pi or mineralising filter also available.